This week I started working on a 1/72 Late Roman army. I'm using Hat's 8087 Late Roman Heavy Infantry and 8100 Late Roman Medium Infantry. The Plastic Soldier Review marks these two sets as the same size, but really they don't match up that well. 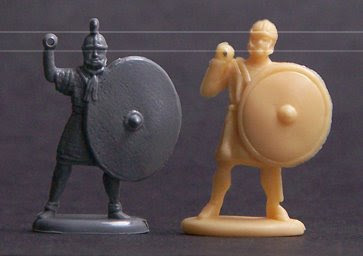 The heavy armored figures are in Hat's older sculpting style: detailed hard plastic, but small. The medium infantry are in their newer rubbery plastic, and are a full head taller. Hat's missile troops are also in the newer style. The heavy infantry's shields are a good deal larger than those carried by the medium infantry, which further highlights the contrast in model size. In my view the medium infantry's shields could stand to be a bit larger, and the heavy's shields should defintitely be smaller. The scale difference won't stop me from using them together. There are a few tricks to making the heavies look taller, and I might try trimming their shields. Still, it's a shame that all of Hat's Late Roman offerings weren't sculpted with the same proportions. very informative, more please as you get to them. Will do! Sometimes I think that I am being too picky with the size difference. I have alot of boxes in my closet. I'll see if can make some other useful comparisons. Initially, I preferred the medium infantry's sculpting. Their style is similar to 28mm models. But, as I started painting I noticed the detail is lacking. So I like their size, but am not too impressed with the detail. Hat must have hired a new sculptor. I have the medium infantry and have seen the heavy infantry but not together. I would agree that the detail is softer on the medium infantry, probably because of the plastic used. However, I should think they will work just fine together.